I've lived through a lot of hurricanes. There are two things I know about them without a doubt. (1, No one can predict where one will hit and (2, no one can predict how strong it will be. All those weather guys in their windbreakers grimacing into the wind and rain are just guessing, and often they are no better at guessing than the man in the street. The word went out last Thursday and Friday that Hurricane Irene was going to hit near New York City Sunday, and it was going to be strong. That was enough for me. I left on the bus for upstate New York, where my daughter lives with my two grandsons, at 2:30 on Friday. I've ridden out many a hurricane that hit the Eastern Shore of Mobile Bay over the past 18 years. They are fearsome acts of nature, full of lightning, thunder, rain and winds that snap pines in two and slam them into nearby houses, cars and people. The power goes out and inside your abode you hover listening to the sound track that strikes a certain amount of terror into your heart, while you occasionally glance out a window at the show. Evacuation is an option but getting out will only take you to a slow moving line of traffic going nowhere except usually deeper into the storm. I always stayed home while most friends, particularly those who had not endured the storms, tried to get out, but usually returned with tales of trying to get upstate only to find no lodging and that the hurricane beat them there. 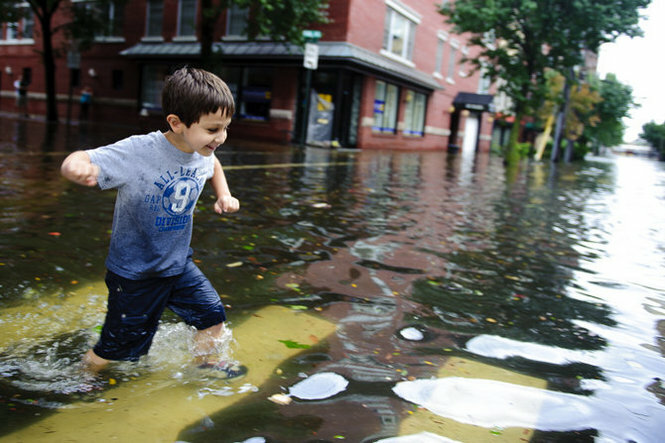 This time, knowing Hoboken's tendency to flood just from a rainstorm, and living in the flood-prone area of the city, I knew enough to call my daughter and say, "I'm coming." She lives in Kingston, which largely escaped the hurricane although there was some flooding and power outage. Her house was high and not exactly dry, but unscathed. In the early morning hours I awoke, and not hearing thunder or experiencing the flashes of lightning or even hearing wind, I looked out the window of my wee bedroom. It was raining, all right, in heavy sheets--and the wind was blowing it horizontally, hurricane-style. I was glad not to be in Hoboken, as I knew the streets would be rivers and the basement of my building was bound to wash away my stored winter clothes and cartons of old treasured items. I was unsettled and antsy all day. Being dislocated and picturing your stuff floating around in dirty water can do that for you. I wanted it to be over, and to be home. Unfortunately the buses and trains weren't running on Monday and I had another day of peace and quiet to secretly fret about the condition of my building and my town. My upstairs neighbor, Mark, emailed that there was at least three feet of water in the back yard and much more than that in the basement, and my brand-new hot water heater there was submerged and probably inoperable. Tuesday morning there was one big bus with the word CHARTER on it in the parking lot at the Kingston bus station. The bus driver had announced when he pulled in, "Here is your bus to Atlantic City!" and we New Yorkers stood on the sidelines grumbling. A few people were getting in, so somebody finally walked over and said something to the bus driver who admitted that it was the New York bus and he was making a little joke. Bus drivers sometimes have an odd sense of humor. I was able to get home by 11:30 and Mark and his wife were working in the back yard, wringing out what had been in their corner of the basement and I went out at talked with them. The sump pump was working away but there were still a few inches of water to slush around in. I looked around but indulged myself by putting the major clean-up off until today. I called a plumber who can look at my hot water heater Friday. My electricity and gas is working, my cable tv is fine, and I can shower at the gym. I'm going to the gym this morning and the rest of my day is going to be spent lugging soggy cartons out of the basement and sorting out what to keep and what to discard. I'm lucky--and we in this part of the country are really lucky that we really didn't see much of Irene at all. My heart goes out to the places that were harder hit. This year I’ve been to three cities in North America—distinctly different cities, all apparently thriving and each offering a specific kind of beauty. Minneapolis is thriving, busy, modern. It has an artistic side, an elegant side—the latter for the most part is in St. Paul, which for all practical purposes really is Minneapolis. There is an active arts scene in the twin cities with many theaters, most of them professional, a major university—and writers all over town, getting together, talking, teaching, and of course, writing. I went to Minneapolis in early April for a writing workshop conducted by author Jonathan Odell. Jon is a transplanted Mississipian, so we had a lot in common as Southerners in a land where the Civil War is seldom discussed, nor do people necessarily sweeten their ice tea, and tall tales are reserved for standup comedians. We tossed around Southern expressions like, “He’s just talkin’ to hear his head roll,” and “It’s hog-killin’ weather.” Jon was conducting a writing workshop, “Writing in the Middle of Your Life,” at the Loft, which is housed in a spacious building on South Washington Avenue with a café, meeting rooms and classrooms—all for writers. A friend met me at the airport the afternoon before the workshop and gave me a tour of the two cities, saying all the while that I really should see it in the summer when it’s at its best. It was a cold early-April day and there was still some snow here and there, but the town, with its bridges, its wonderful modern architecture, and its sense of itself, were a pleasure to experience. We ate at a Pakistani restaurant and had really excellent food in a clattery, casual atmosphere. Minneapolis seems a business town—intelligent, no-nonsense, with an artistic flair in a very controlled, intellectual kind of way. I viewed some of the historic sections of St. Paul and was astonished to find it was the old-money part of town, dotted with mansions and a beautiful cathedral. Its twin city is the home of the Tyrone Guthrie Theater which is housed in an award-winning new facility that looked to me more like an airport than a theater—but I’m sure still a location of many first-rate productions. Other smaller theater spaces abound in the city. I even was driven past a little Frank Lloyd Wright house with signs in the yard, “This is a private residence. No Trespassing.” How I would have loved to creep around that yard and peek in windows, but no soap. I loved Minneapolis-St. Paul and hope to visit there again—maybe even in the summer! Last month I went to Montreal, where my daughter is going to live next year. This bilingual city reminded me of Geneva, where I spent some six years in the 1980s. It is cerebral and artistic at the same time, with a softer feel than Geneva, I would say. Not closed. Not Swiss, let’s face it. Not quite French, but with that almost-American touch of Canada. It was clean and spruce, its neighborhoods green with trees; its international feeling unmistakable with the plethora of restaurants and citizens in the streets in native garb. Montreal is busy and varied, upscale and historical. I expect many revisits as my daughter works toward Canadian citizenship and a way to build a better life outside the reckless madness of her native country’s political scene. I am writing this from the third city on my travels this year—Santa Fe. This is a unique little city, expensive and esthetic, with a distinctly spiritual tone. Its main attractions are churches, including the breathtaking little Loretto Chapel. Loretto has a legend, that the Sisters of Loretto who were working in the lovely little chapel patterned after Sainte-Chapelle in Paris needed a staircase to the loft and prayed to St. Joseph for help. A stranger showed up and built a spiral stair, using wooden pegs instead of nails and creating a work of art that was just the staircase they needed. He then left, not giving his name and not accepting any money for his work. They never saw him again. There are Indian (Native Americans here still refer to themselves as Indians) stories of miracles, Catholic stories of miracles--the city is awash with tales of magic and religion of all definitions. Santa Fe has a "look," preserved by strict historical preservation ordinances. Almost all the buildings are in what is known locally as Pueblo Revival style, others are called Territorial style which look like Western traditional wood framed structures. The effect is unity with a certain elegance. It has also become a major center for fine food. Not only Mexican, although that cuisine enhances most of the menus in town--there are top-notch eateries for Italian, Asian and Indian even molecular gastronomy. Through it all there shines a city with a distinct personality, like a friend you want to get to know better. Even the tourists here seem better dressed than in other places.